brandflakesforbreakfast: would you share your last chocolate square? 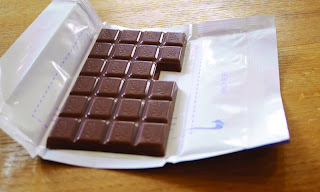 would you share your last chocolate square? Everyone loves chocolate, and this chocolate bar offers a lot more to love… or share. Milka uses their product to push the envelope and represent their brand message “Dare to be tender.” Their latest campaign offers consumers the chance to experience the brand message by testing their tenderness. They produced millions of chocolate bars with one missing square, and then they offered people the chance to reclaim their missing square or send the square with a special message to someone else. Brilliant! This is really brilliant. And so sweet as well.